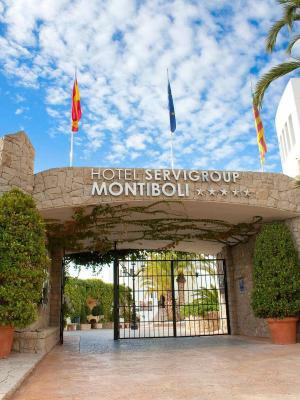 Lock in a great price for Hotel Servigroup Montíboli – rated 9.1 by recent guests! The beach, the pool and all the facilities around the hotel are awesome. Food was excellent. Staff amazing. Beautiful location. The romantic bedroom view was beautiful! The staff were friendly and the breakfast was good. Excellent location for relaxation on top of a cliff. The food was excellent. Especially the tomatos and salmon. The hotel and facilities were clean and tidy. Exceptional view and an ok beach. Professional staff. Top class! Amazing sea view, beautiful palms and unexpected elevator to go to the beach. 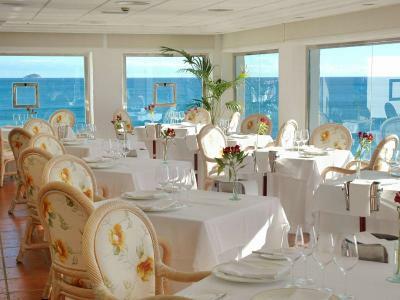 Spectacular meals served in the restaurant and very tasty snacks in the bar. 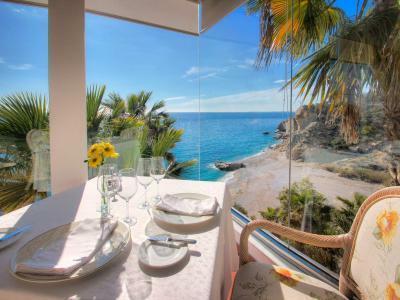 A unique hotel, built on and around the cliff above two beaches. Full of interesting art and sculpture. Lovely hotel and grounds. Staff friendly and professional. Beautiful surroundings, friendly, helpful staff, great food. This was my second stay and will not be my last. 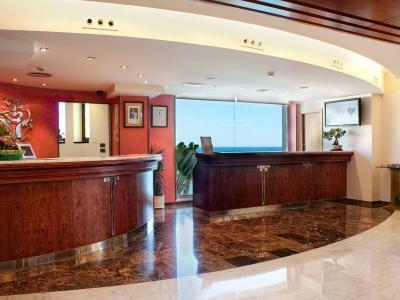 Hotel Servigroup Montíboli This rating is a reflection of how the property compares to the industry standard when it comes to price, facilities and services available. It's based on a self-evaluation by the property. Use this rating to help choose your stay! 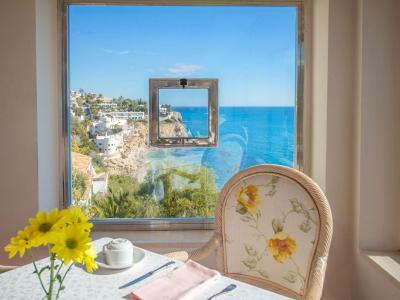 One of our top picks in Villajoyosa.Set on a cliff-top, this impressive Arab-style hotel enjoys direct access to L’Esparrelló Beach. It offers 2 outdoor swimming pools surrounded by sun terraces with impressive views of the Mediterranean. 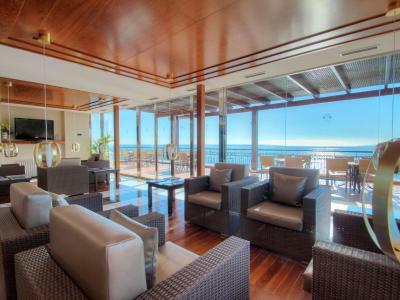 The elegant Alhambra bar-lounge at Hotel Servigroup Montíboli features a terrace with panoramic views over Caleta Beach. La Proa Bar serves drinks and snacks by the pool during summer season. 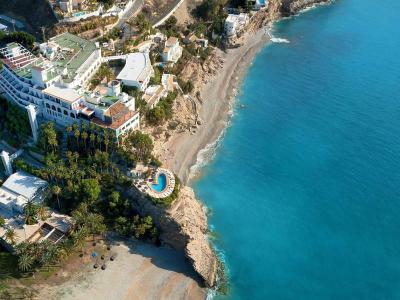 Located on the outskirts of the fishing village of Villajoyosa, the Hotel Montiboli offers a privileged setting surrounded by beaches and beautiful gardens. 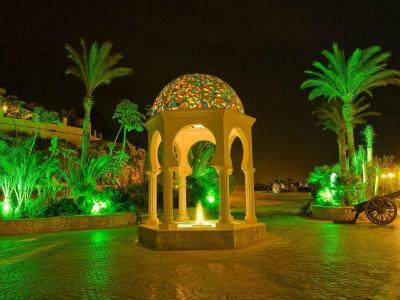 It is 5 mi from Benidorm and 20 mi from Alicante. The Emperador Restaurant offers an à la carte menu. A special menu for celiac guests is available on request. 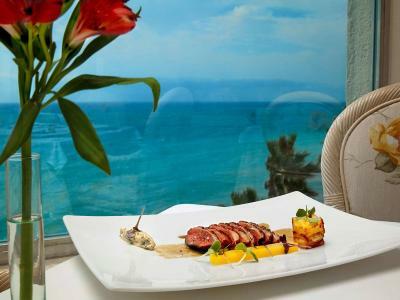 Guests can also enjoy tasting menus. 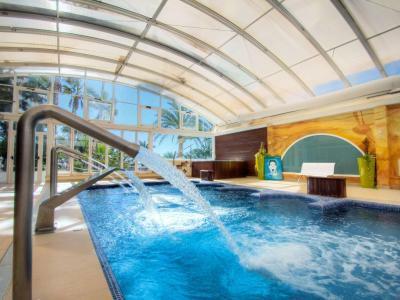 The wellness center features a swimming pool with jets, hydromassage beds, hot tubs and sauna, as well as Turkish baths. Facial and body treatments can be booked. 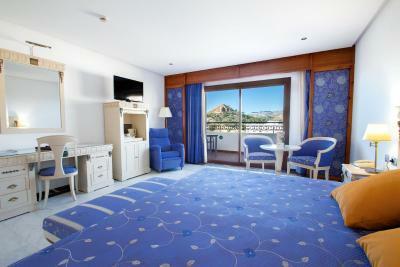 When would you like to stay at Hotel Servigroup Montíboli? Room capacity: maximum 3 people. If your booking is for more than two people sharing a double room, please indicate it in the comments field; also specify whether they are adults or children. 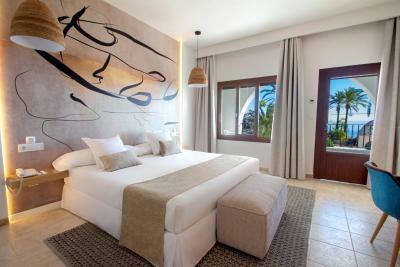 During the high season there may not be availability for additional people, in this instance the hotel will inform you. Additional people, adult or children, will pay a fee, which is not included in the price of the booking. 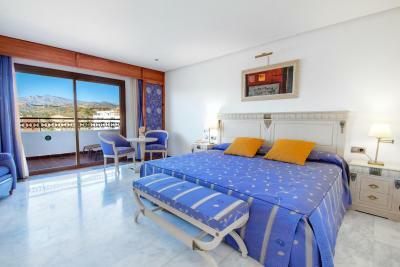 This spacious, air-conditioned room has a terrace with sea views. It comes with free Wi-Fi, satellite TV and a large bathroom with a bathrobe and slippers. 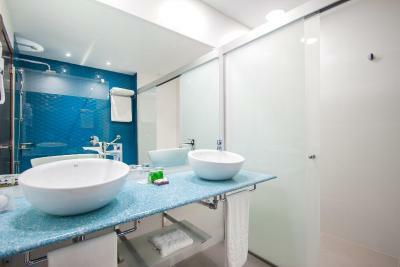 This air-conditioned suite features free Wi-Fi, satellite TV and a private balcony. 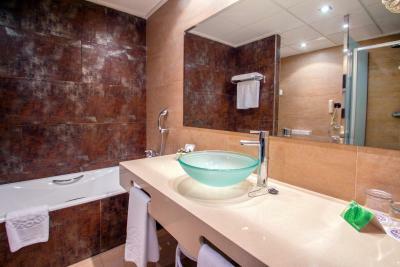 There is a safe and minibar, and the private bathroom includes a hairdryer, bathrobe and slippers. 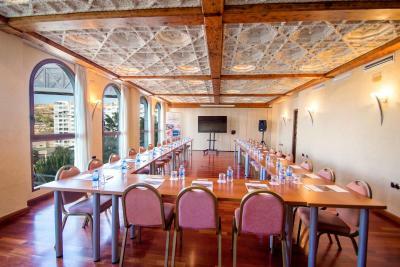 House Rules Hotel Servigroup Montíboli takes special requests – add in the next step! Hotel Servigroup Montíboli accepts these cards and reserves the right to temporarily hold an amount prior to arrival. Please note that the booking, once charged, is nonrefundable. This is because the rates have discounts applied. Please note that guests must present the credit card used to make the reservation on arrival and a valid ID. Payment by someone who is not a guest is not allowed. Please note that bed types and special requests are subject to availability and may have extra costs. If a reservation is made for more than 1 room, guests must include the name and surname of a lead guest in each room. Please note that guest name changes are not permitted. This is because they have discounts applied. Please note that the room cleaning service is from 12:00 to 16:00. After check-in, guests can enter their room as soon as cleaning has been completed. Please note that Half Board and Full Board rates do not include drinks. Free WiFi is available. The property cannot guarantee bandwidth or the connection of all devices. The link offered is only for internet navigation, checking emails by web browser or mobile apps with low data consumption. The property therefore cannot guarantee total coverage in all areas of the property, as some areas may have poor signal reception due to the structure of the building. The hotel has air conditioning during the summer months. Please note the published rates for half board stays on 24 and 31 December include a mandatory fee for the gala dinner held on that evening. Rates for stays on 25 December include a mandatory fee for the gala lunch. Super breakfast. Nice restaurant food in evening. Our stay in Servigroup Montiboli hotel exceeded our expectations! We enjoyed spectacular views from the top of the cliff, our comfortable spacious room, exquisite a la cart dinners and beautiful weather! The tiny aperitif dishes from the chef were fabulous! We felt like guests on a private villa, rather than staying in a hotel. There are beautiful trees and flowers around. The air smells of sea and flowers. The staff were helpful and friendly, especially in the restaurant. On our departure day we had our breakfast delivered to the room, even though it was only 7:30, before the regular breakfast time! We would like to come back to the place. Would have preferred a balcony looking directly at the sea, but the side view was nice as well. Breakfast was very nice and staff very attentive. the rooms need a complete make over of the rooms: Furniture is worn off, Moskitonets are unusable as they are cut, towels have past their due dates. Bedcovers looked in some rooms so muffy, that we decided not to sleep there. Curtains need a wash. Shower amendments ran out after the first night, one socket (powerpoint) had no electricity. Hallway leading to rooms smelled of smoke ( we saw staff smoking outside the door). Beachtowels offered against signature, which is hilarious for 5 Star. No signed Hotel area at the beach, guests have to pay €18 per day for lounger and umbrella, which is unheard of for a 5 star hotel. The webpage claims to have many activities. Some are declared to be extra costs, however most of them do not. So when we get excited to do Kayaking ( shows no extra costs on the page) and find out its in the village for extra costs, the Hotel is asking for disappointment on the guest side. There are really many small details we picked up on in this hotel, as regular 5 Star guests around the world. Like the sugar tray on the table needs to be cleaned and not just refilled. One major customer service issue we had, was that we booked a junior suite that had no view and our other option was a bungalow that really was not worth a 5 star nor the amount. That the difference of 130€ to the room we chose at the end (by own choice) was not reimbursed, we understand. However offering a €12 voucher for the sauna in August when its 35C outside, is truly unacceptable.